Jon Stewart: Racist or Condescending Jerk? Comedian Jon Stewart, a favorite of the oh-so-sophisticated progressive set, recently perfomed a skit on his television show aimed at conservative journalist Bernie Goldberg. In the skit, Stewart, for some reason, chose to adopt a fake, exagerated African-American accent and even lampooned Gospel music. The skit was highly offensive, to say the least. In fact, it could be viewed as racist. Sonja Schmidt, host of "Left Exposed," has some thoughts on this matter. 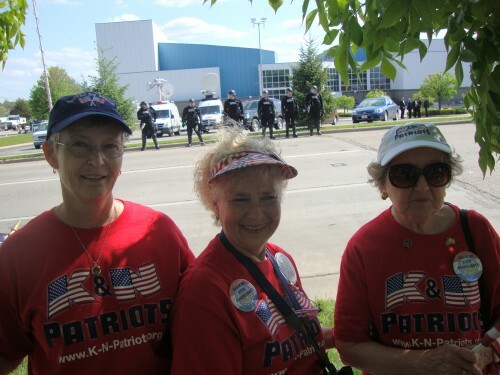 Police in full riot gear were called out in Quincy, Illinois, because of the threat of violence at a Tea Party rally near where President Obama was speaking. Here's a video of the horrible encounter. Did you hear the screams, the shouted obscenities, the racial epithets, the spitting, the thrown water bottles? Neither did I. Here's some pictures of the threatening crowd. You know how mean those older white women are! Progressives everywhere can sleep easier tonight! Here’s another example of a “mostly peaceful” pro-illegal immigrant demonstration in Phoenix. Imagine the media’s reaction had this occurred at a Tea Party. 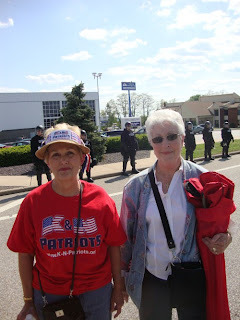 Not one act of violence at Tea Party demonstrations (except for when Tea Partiers were assaulted), and progressives and the mainstream media called them threatening and racist. Below is a photo of an anti-Sarah Palin demonstration in Eugene, Oregon. 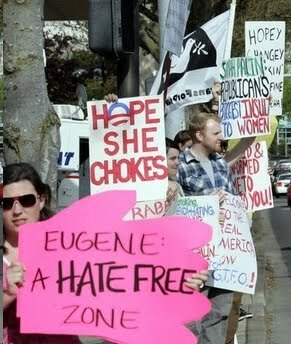 I gather that hoping a political opponent chokes to death does not constite hate in the enlightened town of Eugene. Catchy use of the Obama symbol, though! An African-American columnist for the New York Times, Charles Blow, decided that he would attend the Dallas area TEA Party event. Although he did not see any overt signs of racism displayed by the largely white crowd, he saw something that was even worse, in his estimation. He saw a conservative African-American speaker, Alfonzo “Zo” Rachel, addressing the crowd. “It was a farce,” Blow wrote. Rachel was only trying to show that he was one of “the good ones” to the whites in the crowd. Blow, his liberal white handlers at the New York Times and progressives in general are right to fear Zo and others like him. Zo demonstrates that when people of color think for themselves, they leave the Democrat plantation. And so, they savage any minority who dares stray from the party line. Just look at the abuse heaped on people like Clarence Thomas, Condi Rice and others. No slander, no insult, no racially inflammatory phrase such as “minstrel show” is off limits to them. But the worst, most vile and vicious verbal assaults come from other African-Americans like Blow who is trying very hard to show his bosses that he is one of “the good ones."